In this scenario, the raw JSON files can differ in format per file, but the output is consistent per file so analytics can be performed on the data much, much easier. 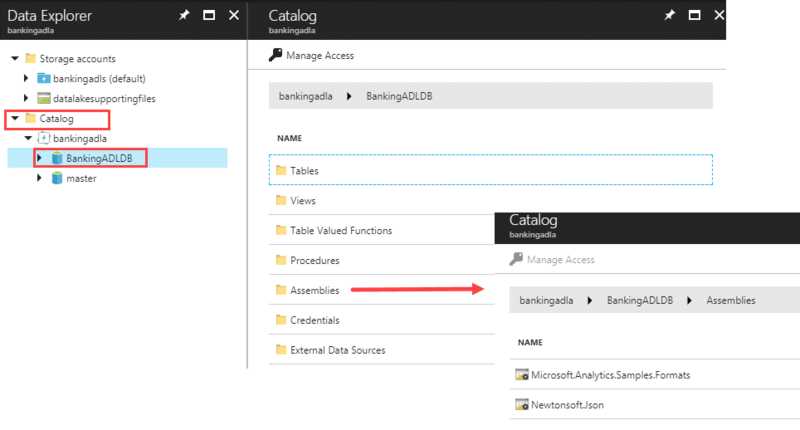 You need to have Azure Data Lake Store and Azure Data Lake Analytics provisioned in Azure. Currently the JSON extractor isn't built-in to Azure Data Lake Analytics, but it is available on GitHub which we need to register ourselves in order to use. There are two assemblies we are concerned with, and they are available from: https://github.com/Azure/usql/tree/master/Examples. Fork the USQL repository from GitHub. In Visual Studio, open the Microsoft.Analytics.Samples.Formats project (under the usql-master\Examples\DataFormats folder). Locate these two DLLs in the bin folder: Microsoft.Analytics.Samples.Formats.dll -and- Newtonsoft.Json.dll which should be located in <PathYouSelected>\usql-master\Examples\DataFormats\Microsoft.Analytics.Samples.Formats\bin\Debug. Hang onto where these two DLLs are - we'll need them in step 3. Make sure these DLLs are added to your source control project, along with the rest of the U-SQL scripts mentioned in the remainder of this post. We want a new database because we need somewhere to register the assemblies, and using Master for this purpose isn't ideal (though it will work for these two assemblies, I've found it doesn't work for another custom assembly I tried -- so I make a habit of not using Master for any user-defined objects). Also, if you end up with other related objects (like stored procedures or tables), they can also go in this database. Mine is called 'BankingADLDB' for two reasons: My demo database is about Banking. And, being the naming convention queen that I am, I prefer having 'ADLDB' as part of the name so it's very clear what type of database this is. Note I gave the script a relevant job name so if I'm looking in the job history later, the scripts are easy to identify. Sidenote: Don't forget to specify relevant security on the new Assemblies folder so your users are able to reference the assemblies when needed. Finally! We're past the setup and arrived at the good part. And, that's it. Very easy to do on an ongoing basis once the initial setup is complete. There's also a multi-level JSON extractor posted to GitHub which I haven't needed to use as of yet. If you have numerous levels of nesting, you will want to look into that extractor. One reason this approach works well for me: if a new property should slip into the raw JSON and you don't know about it, as long as you're keeping the raw data indefinitely you can always re-generate the standardized data. In the meantime until the new property is discovered, it won't error out (this isn't always the behavior for every U-SQL extractor but it does work for this JSON extractor).